Okay, it is spring finally, and some of the daffodils are blooming and so are the crocuses, and we spent all day today and yesterday raking and pruning and rearranging the plants. 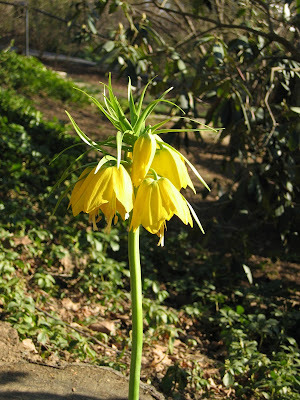 But this here fritillaria? It was forced. Yes, it's now planted in my garden, and with luck it'll bloom again next year, but it didn't bloom here in situ. The other day as I was walking through the greenmarket on the way to work, I spotted some forced fritillaria in full bloom. I idly thought about buying one, mostly because I've never seen them forced before. But I didn't. Sometime later, someone scurried past my desk with one yellow fritillaria muttering "I've got to get rid of this, it smells like marijuana." I scurried after her, and told her I'd take it home. I schlepped it home, on the subway, on the train. It does smell funky, but now it's outside, where it belongs! It seems like when you raise 'em on your own, force them, they're like your children. Every day I look at them, noticing some new nuance, color, growth. This flower and child rearing - it's so self-congratulatory, seeing how you've brought about something so beautiful and amazing. And the flowers, they don't talk back! And that smell repels squirrels and raccoons, so they don't get eaten. Double bonus! And just coming back to correct that---so the flowers don't get eaten by the animals!